The first product brought to the market by Richelieu Boat Woks Inc is an elegant 11 foot catboat dinghy from the pen of the famous American naval architect, Charles Wittholz. The boat carries 80 square feet of sail and with its 5 feet beam, is very stable and much more spacious than an inflatable of the same size. The Bras d’Or 11 has excellent sailing and rowing characteristics. You may judge by yourself in viewing the boat in action in the videos section of the site. Initially the Bras d’Or 11 was built under the direction of Keith Nelder by Big Pond Boat Shop Inc. located on the shore of the Lake Bras d’Or in Cape Breton, Nova Scotia. You have guessed right, this is the origin of the name of this nice looking little catboat. Since the beginning of 2009, the fiber glass hulls of the Bras d'Or 11 are being built by HTM Composites Inc of Neuville near Quebec City. This firm has experimented extensively with vacuum related manufacturing processes like infusion, vacuum bagging and vacuum/pressure bag moulding. 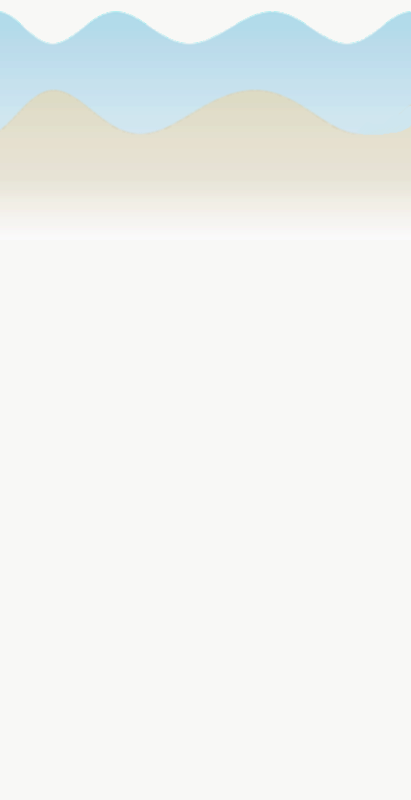 They have developed tremendous expertise with these processes. The preparation and final assembly of the interiror components of the Bras d'Or 11 is done in collaboration with Jean-Guy Leblanc of DelBlanc a/s Inc in their shop located in Verchères on the south shore of the St-Lawrence near Montreal. 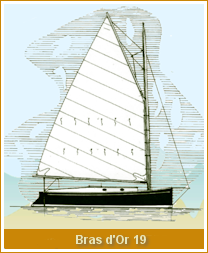 This 19 feet catboat has been designed by Keith Nelder of Big Pond Boat Shop Inc. It represents the synthesis of the various catboats built by the yard over the years, most designed by Charles Wittholz and Joel White. These two great naval architects were renowned to design traditional looking boats mixing modern material while preserving the classic lines. Mr Nelder being born in England, it is not surprising to find in this design some resemblance with the British Gaffers. The hull and the interior have been optimised, from the beginning, to accommodate the battery banks (up to 8 batteries) required to implement electric propulsion, either inboard (a 3HP integrated package from ELCO Motor Yachts) or outboard (Torqeedo 2.0R). A gasoline outboard or small 7HP Diesel can also be used as auxiliary propulsion mode. Then additional ballast has to be incorporated under the cabin floor: lead or water ballast. 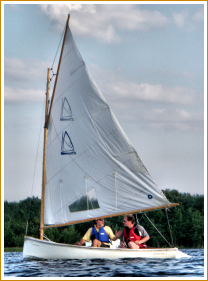 The Bras d’Or 19 is the quintessence of the classic lines Catboat. The boat comes with or without a small cabin, is very robust and can be towed by a medium size vehicle. The Gaff rig cabin version of the Bras d’Or 19 is now available at a launching price of 27,500$CA (sail included). A summary of the plans and characteristics can be obtained by sending an e-mail to : ducharme.louis@sympatico.ca. Please mention your name, your home town and phone number. 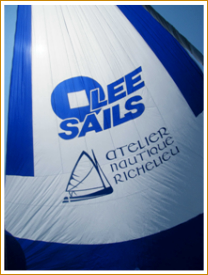 Early in 2008, Richelieu Boat Works Inc has been chosen by Lee Sails Canada Inc to be its exclusive agent for the province of Quebec. These high quality sails are fabricated by CHEONG LEE SAILMAKERS LTD of Hong Kong.